Children draw the sun as yellow, but if you actually look at it then it's all white. The moon can be white or yellow, and we have an expression that says "blue moon". (which actually is a month with two full moons - the second one being the blue one). But did you know that the moon actually see itself as red? It means it has fear, but only for the reason to save people. Your comment about the moon seeing itself as red is a curious statement. How do you know that the moon sees itself as red? Have you had some kind of communication with it? When the moon is full, or even close to it, I've seen its aura and haven't seen any red in it. What I saw was a very lit up blue aura on the moon's edge. The aura extended far away from the moon and the colours faded and turned into a 'mist'. Those colours were mostly green and indigo. 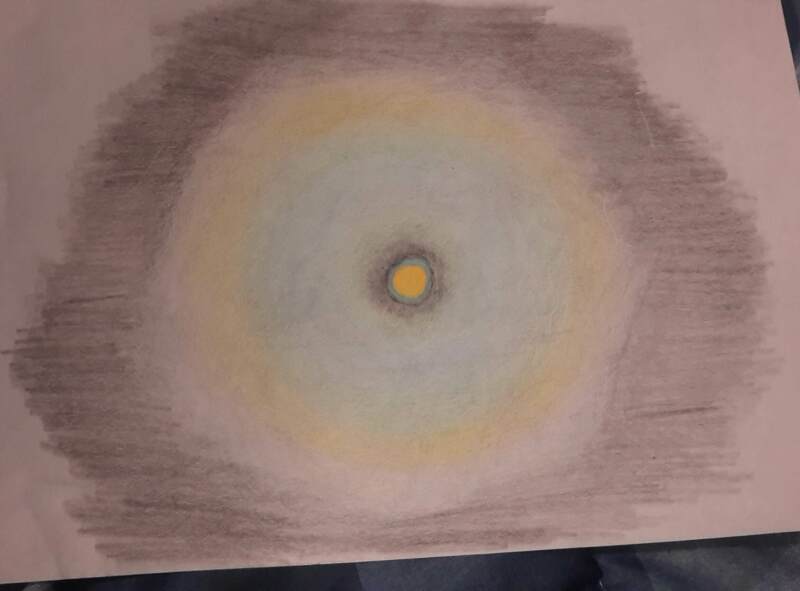 I drew what I saw but coloured pencils can't do any justice for the aura. The colour red has many meanings and I've never associated it with fear. This says that black symbolizes fear among other things. I'm curious how you came to your conclusions as to why red symbolizes fear and how the moon views itself as red. one month is one moon - so how can you have two full moons in one month? Two moons happen because a lunar month is shorter than a solar month. I don't understand... If moon directly translates to month... Which is every 28/29 days... Then what's a solar month... Isn't solar a yearly measurement of linear time? Our calendars are based on the sun's movement. If we were to use the moon for a calendar, it'd be different. The moon's orbit is smaller so it moves faster in the sky compared to the sun. Since a solar month has a couple more days (30 instead of 28) it means the moon can show up, every now and then, twice in a month. Children do draw the sun as yellow. I've always considered the sun as the colour yellow. A golden giant. It was, or used to be. In the bright midday of Summer, the sunlight was bright yellow and its rays were golden. There were sunspots within the rays that were yellow, white and orange. This isn't the case anymore. The sun now is white, and a white dwarf star. It's so bright that I have to cover my eyes when walking. I never used to have this problem. The sun rays are ghostly white and blue! There is a pale blue streak. Sunspots within rays now are violet coloured. This isn't the sun that I remember. As for the moon thinking itself as red, this is strange. The moon is seen as white, but it's actually full of coloured gemstones on the surface. The moon is also different too. Now we have a Cheshire Cat grinning phase of the moon! This never happened prior to 2016. 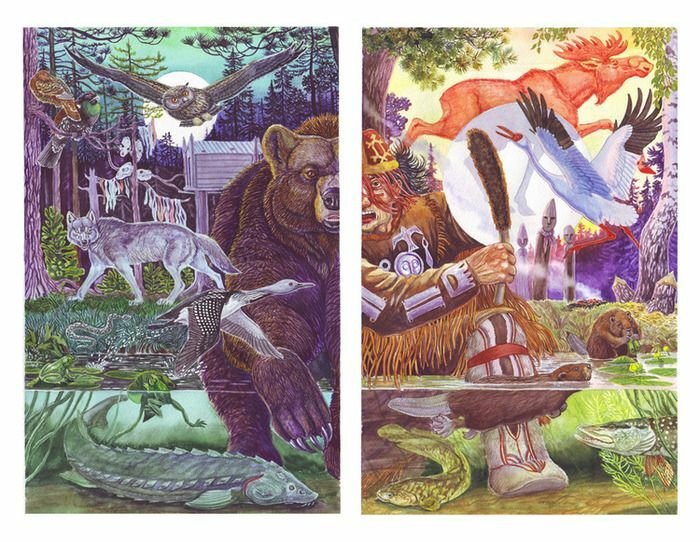 In Finno-Ugric/Siberian mythology ….The world was born from a Waterfowl or an Eagle Egg: (Alternativly "The Earth Diver Myth" is also told). The stars were made in heaven …..
(An egg or oval shaped shaman drum - the universe in a drum). In most Aboriginal cultures the Sun is female and the Moon is male. This applies to Australian Aboriginals, Indigenous Europeans, (shamanic) Siberians, Melanesians and Koreans to name a few. Perhaps beliefs differ from tribe to tribe, so making generalizations is not at all a good idea?